Grades 1 & up. These engaging, active learning classroom tools are great for games, review, and testing in all subjects. When the paddles are held up, the student's answers are easily seen from anywhere in the room. Use the matching colors for teaming exercises. Each paddle has one blank dry erase side and one lined dry erase side. Easy to store, paddles clean up easily even after extensive use with a damp cloth. Markers store neatly right in the handle. Class set includes (6) each of four, vibrant colors (24 paddles), 24 dry-erase markers w/built-in eraser, 4-pack of large, colored, dry-erase markers, a convenient storage box and an activity guide. 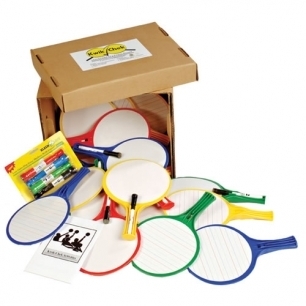 Student pack includes (2) kwik-check paddles with markers and eraser caps.